This tomb is second in size only to that of Seti I and has become known as the Tomb of the Harpists. Its construction differs from the regular tomb in that five small chambers lead off either side of the first and second corridors, making ten in all. Each is devoted to aspects of the Pharaoh’s life. It is also interesting that the first part of the tomb up to the third room was built by Setnakht, father of Ramses III, and in places where the paint has fallen off his cartouches are revealed. This is the tomb, it will be remembered, where the third corridor was diverted to the right after its builders had broken into an adjacent tomb by mistake (see page 105). Although the wall decorations may not be considered of the best artistic quality, their variety and richness are certainly unsurpassed. The entrance door is at the foot of a flight of steps on each side 0 which are small pillars with bulls’ heads. Over the door is representation of Isis and Nephthys worshipping the sun-disc. Along the first corridor are figures of Maat, goddess of integrity and truth, kneeling and sheltering with her wings the deceased Pharaoh as his body enters the tomb. 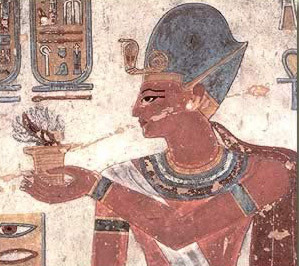 On the walls are Praises of Ra. The pharaoh himself can be seen on the left-hand wall before Harmaches (one of the forms of the Sun-god), followed by the familiar sacred serpent, crocodile and two gazelles’ heads. We now turn to the five small chambers leading off the left-hand side of the corridor. The first chamber (a) contains various scenes of cooking, slaughtering and baking. The second chamber (b) has, on the entrance wall to the left, the kneeling god of the Nile bestowing his gifts to seven gods of fertility which have ears of corn on their heads. On the wall to the right the Nile-god is seen before the serpent-headed goddess Napret, five apron-clad royal snakes and two gods of fertility. The third chamber (c) is largely decorated with male and female local deities with offerings. In the bottom row are kneeling Nile-gods. The fourth chamber (d) has representations of the guardian spirit of the deceased on either side of the entrance, each bearing a staff ending in a royal head. The other walls show double rows of rowers, sacred serpents and sacred cattle. The fifth chamber (e) contains the representations that gave the tomb its name: on the left wall are two harpists, one before Anhor and the hawk-headed Harmaches, and the other before Shu and Atum. The text on either side of the doorway is the song they sing asking that the blessed Pharaoh might be received. As already stated, there are five chambers on the right-hand side of the corridor. The first (/) contains a double row of sailing ships: those in the upper row ready to set sail and those in the lower with sails furled. The second chamber (g) is the Pharaoh’s armoury. The walls have representations of all the royal weapons and standards. At the top of the left-hand wall are standards with heads of sacred animals. At the top of the right-hand wall are standards with gods’ heads. On the rear wall are a multitude of bows, arrows and quivers, The third chamber (/;) is particularly interesting if we remember that this was a very wealthy Pharaoh, for it contains his treasury. On the walls are representations of furniture and ornaments, utensils and jewellery, elaborate head-rests, cushioned benches and comfortable couches that are attained by steps. The fourth chamber (i) as rural scenes. The Pharaoh sails along a canal watching plough- ng, sowing and reaping. In the fields are sacred animals. The last on the right-hand side (j) is notable for its twelve different forms of Osiris, the god of the underworld. The following corridor (8) is badly damaged, as are the antechambers that precede the tomb chamber itself (10). This is a long oblong room with four pillars on each side and an extra chamber at each of the four corners. The actual sarcophagus is now in the Louvre, its lid is in Cambridge, and the Pharaoh’s mummy, amongst those taken from the shaft at Deir el Bahri, is now in the Cairo Museum.